About a year and a half ago while I was editing Northern Lights, I started thinking about Final Fantasy Tarot. I used to read the cards regularly, and people told me I was fairly decent at it. It comes from the same place as stories (if that makes any sense), and in my strange experiences life does often mimic art at least symbolically. I share the theory with wiser minds than I that everything is cyclical, and we’re all trapped in this never ending cycle of history’s constant repeat. I ride the line between logic and the desire (if not the ability) to believe in some absolute, and while reading tarot accurately could very well be chalked up to just recognizing patterns and giving vague and general proclamations, it definitely does activate my “storytelling circuits,” and those circuits have an uncanny ability to predict future connections and events. I’d initially considered Cloud (FFVII) for this one. Of all of the main characters he definitely starts off as the most “blank slate” in need of molding due to his past being essentially wiped clean by horrible methods. In a way his journey is more about re-finding himself than molding an identity anew. He’s a bit of an uncanny fool as opposed to the happy-go-lucky fellow above, utterly sullen and uncaring at the start of his hero’s journey, but finds purpose along the way. The Fool is supposed to untapped potential and unlimited possibility. With this archetype the choices have not yet been made, which can lead to the greatest peril. The Fool is the perfect Major Arcana for quite wavering heroes who have not yet figured out where their footsteps should fall. Next week is I The Magician. Leave guess for whom you think I might pick in the comments! I can see Cloud fitting that card, but personally, I picture Tidus as “The Fool”. He definitely starts in a blank state at the beginning of FFX. He also seems more, well, foolish. I also have no knowledege on Tarot cards lol. Looking forward to seeing who the Magician is. I think I put Tidus as an alternate! I picked Cloud because I like him better, and he actually exists hehe. Granted, I HAVE heard the theory that the entirety of FFVII is just Aeris’s dream, which is why she’s the first and last person you see, but I don’t actually believe that. I think I landed on Cloud (ugh potential bad pun) because Tidus was technically a dream who dissolved at the end of the story, and though his influence lingers on, he himself doesn’t (I haven’t played X-2, so I’m not sure what happens there). Cloud actually learns from his hero’s journey, which is what the Fool hopes to accomplish. I totally had to think about Kefka though surface wise, but in terms of what the card is supposed to stand for, a good main character who starts off sort of drifting, but becomes heroic, is a pretty good choice. I love Yuna so hard, and Lulu, and Rikku. Final Fantasy is a treasure when it comes to female characters. I discovered that happy fact when I first played VI. IV, which I played later, leaves more to be desired, but VI is perfect with it. I’m sure I’ll think this even more when I finally get to FFXIII and Lightning! I liked Aeris, but Tifa and Barret were tied as my favourite characters in FFVII. It’s great that female gamers have so many strong characters to relate to these days. It’s so nice to see the industry representing us well and I think Square paved the way with Final Fantasy. Yuna, Lulu, and Rikku inspired the teenage me for sure. Lightning is just plain awesome in my eyes. A warning though, her attitude is a bit annoying in the beginning of the game. My favorite character in that game is Sephiroth of course hehe, but if I had to pick a “hero” character, hmm, it would probably be Vincent. I just love the tortured and brooding type, and I love the “vampire” headcanon fans have created for him. Frankly, fandom headcanons are just fascinating. Like how Sephiroth is considered a general even though that’s never once stated in the game. I love how worlds spawn other worlds. I think if I can deal with sullen Cloud and broody Squall, I’ll be fine with Lightning 😉 I’ve defended both of those characters even though Cloud is definitely not one of my favorites. Square has always done a good job of making characters with understandable motives, even if you may not find them likable. I never would have guessed you liked Sephiroth… 🙂 Believe or not, I beat the game and never got Vincent, oops. All of the Final Fantasy characters are so entertaining. Square is great at developing interesting people. Can I just say that this is an awesome feature? I loved reading about your assessment of “The Fool” of Final Fantasy. I know very little about Tarot cards so I’m learning something as well. As far as the magician goes, with my limited knowledge, I will guess Vivi (FFIX) based on the name alone. Looking forward to more! Vivi is a great guess and a great character! I love that little guy. Ah I haven’t thought about IX in a while and it’s my second favorite in the series. Can’t wait to get to it. I’m on IV right now so a ways to go. I’m going on vacation in a few weeks so I’ll have time to catch up with everything including gaming. Hoping to finish playing AND reviewing IV by then so it’ll be on to V.
I shall reveal all next week! I don’t know the meaning of Tarot cards, but based on the name alone I vote for Vivi to be the magician. Right? I can’t believe they haven’t, because they’d make serious bank. I have a deck of FFVII playing cards that I definitely cherish, but an FF tarot deck would be the pride of my collection. I DO have a Tarot of the Sephiroth, but that’s more of a shared reference. I am really enjoying the feedback I’m getting on this and the guesses people have made. I definitely have a Magician in mind, but there are some very valid alternates. Yeah, i agree. Ahh, how lucky 🙂 So far the closest anyone can get to a Final Fantasy deck would be the Yoshitaka Amano tarot deck. It’s not FF characters, but its made by the same artist who designed many characters in FF. Oh and I checked out the Tarot of the Sephiroth deck, it’s really cool. I am looking forward to hearing your take on the Magician. I’ve seen that deck! Amano is one of my favorite artists and I got into him due to Final Fantasy. Then I saw his work for Sandman and Vampire Hunter D. Omg so amazing. Everything that man does is exquisite. I own a few Final Fantasy art books, and I really want The Sky. I’m so happy I decided to post this actually! I was a bit wary about it, because you never quite know how people will take it, and I’m super shy and a worry wart. I know Final Fantasy really well, and as stated I used to read tarot, I’ve studied it and astrology, and I’m currently reading The Mystical Qabalah (which talks about all of that to explain the Tree of Life), but you never think you have enough knowledge, you know? Tarot is a great deal about interpretation so I’m always interested in what other people think regardless of their experience with the system. Its okay to worry, that just shows that you care about what you write. That’s a good thing. Seems like you know quite a bit about the cards. I haven’t read that much about Tarot and Qabalah yet. I should probably do that soon. Lately, I’ve been reading a bit about tarot from a psychological vs. spiritual perspective. Honestly, I think Tarot is one of those subjects you can study for years and years, and still learn something new. Completely agree! It’s like a story with many layers where more of them unfold the longer you look at it. Hi, this is an exciting topic, thanks for starting this! And sorry to jump on the bandwagon a bit late. I get your choice for Cloud, he definitely goes on a Fools journey through the story. My first thought was Zidane, his entire story doesn’t fit like Cloud’s does, but his beginning seems more like how I picture the Fool. Foolish optimism, taking a much bigger step than he realized, etc. Kind of the Monkey’s Journey type of fool, seems like chaos, but turns out. 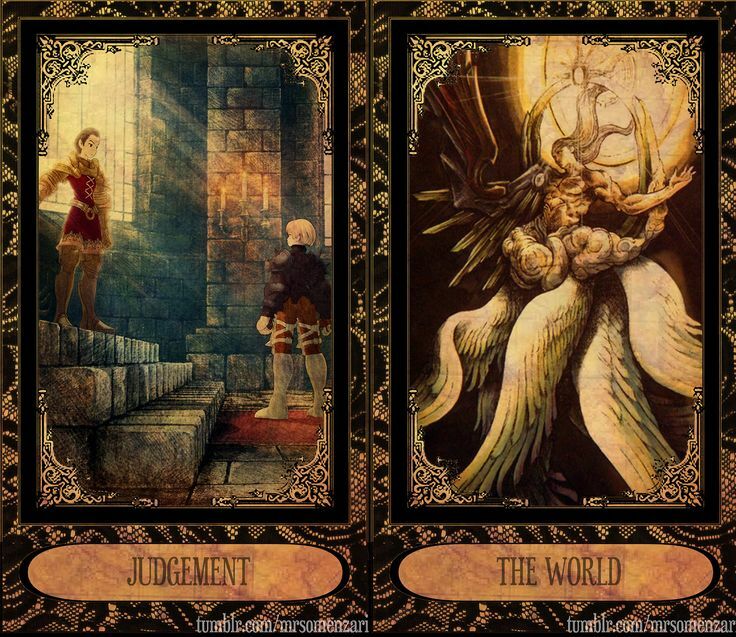 Also, the Yoshitaka Amano tarot deck is now on my wishlist, amazing especially the Chariot card! No need to apologize and so glad that you commented with such good insights! Now that you’re mentioning it I can definitely see Zidane as the Fool in both story arc and attitude. The Fool has a much more happy-go-lucky air than Cloud, and really him (Cloud) and Zidane are almost polar opposites in how they end up. Zidane starts off the optimistic hero on his journey whereas Cloud is the sullen, surly mercenary only in it for, well, not even the money (though that’s what he’d try to profess), but rather just for something to do. Then Zidane’s journey gets dark once he realizes what his designed destiny was. He could almost be the Fool in reverse due to that time, but he makes the right choices, breaks with fate, and is a shining example of what the game is attempting to say about such things. All of the main characters have a sort of destiny laid upon them. Vivi was supposed to be a weapon, Garnet/Dagger was supposed to be a princess, Steiner a knight/soldier/protector, Freya was forgotten, Eiko was supposed to stay in Madain Sari, even Quina was considered a failure as a gourmand. IX had a great deal to say about fate and literally what it means to be alive, have a soul, and have choices. I considered Tidus, too, but since he one, annoys me hehe, and two, was arguably not real, I went with the forced blank slate of Cloud. I wanted someone who seemed less at the mercy of fate. Though Cloud is still arguable, and don’t get me started on Sephiroth. That poor thing was utterly screwed by fate. “Sors imanis et inanis” indeed, but thinking about it more, there’s nothing that says the Fool can’t be dictated by fate. I mean the journey he takes through the Major Arcana is already laid in order. That’s an excellent point about the Fool being dictated by fate. I guess the journey could also be a bad journey too, it doesn’t have to be a Hero’s journey at all. So Sephiroth could totally be the Fool. Also, you made me think that the journey might not have started at the beginning of the game. It’s been so long since I played these, but could we say that at the end of the day Cloud is more the Fool than the beginning? In other words, he is optimistic and freely taking the big step of embracing his role as a leader and continuing his work. At the beginning he’s kind of lost, at the end of the game he is starting a new journey, his choice. And I think it would be impossible to talk my ear off about Final Fantasy and Tarot. Through in Doctor Who and I’ll never leave! BTW your posts have inspired me to attempt a play through of all these games, we’ll see how far I get. 🙂 You are reminding me how great the stories are and how fun the game play is. I was definitely thinking about Sephiroth as the inverse of the card, which makes perfect sense since him and Cloud are two sides of the same coin. I have a couple of essays where I don’t stop talking about that hehe, but something VERY interesting I found was the description of FFVII on this site called Grouvee that’s pretty much Goodreads for gamers. “Final Fantasy VII tells the tale of a young man’s quest to defeat a corrupt corporation he once served and exact revenge upon the man who wronged him, uncovering dark secrets about his past along the way. ” Um, that could be either one of them (though I’m certain most people will see it as Cloud)! I was quite floored with how eloquent and insightful that description was. Many game sites don’t go that deep, and while it might just be my own fevered mind seeing shadows out of air, it’s still a valid point that it could refer to either Sephiroth or Cloud. Ooooh I can totally see that as Cloud being more “Fool-like” at the end, which isn’t a terrible thing. He starts out jaded and uninterested, but circumstances lead him to the realization that there are things that matter. Zidane has more of a “foolish” curve. He starts out optimistic and excited, goes down the dark ladder (almost literally if we look at his journeys in the Iifa Tree, but that’s an essay worthy topic), but then comes out even more determined on the other side since he has a dark destiny to rail against. I feel the same way! I love Final Fantasy and I’ve always loved symbolism especially religious symbolism. You’re a Doctor Who fan, too?! Ah my favorite is 10, but 12 is a very close second. I’m not caught up on the latest series and I really need to. I’ve also never seen classic Who, which is something I definitely want to catch up on. I started with Classic Who, it was always on the PBS station and I grew up watching it. 10, David Tennant, is an amazing portrayal, and he is a huge Who fan too, I think his performance really shows. Matt Smith was so good too, he has a lot of Troughton in his performance, if you ever get a chance to catch some of those old ones. David Tennant’s love of doctor who fuels my pipe dream of something happening with me and my love of Final Fantasy VII. I just imagined someone high up finding and loving Northern Lights and ahhhhh I need to stop lol. He pretty much did nothing but write Doctor Who fanfiction and went to acting school with high hopes. Then he became the doctor and married the doctor’s daughter. Life goals accomplished! I definitely want to watch the older ones! Oh and I checked out the Grouvee site and laughed out loud at the backlog tracking – I didn’t know they were in my house looking at the stuff I haven’t had time to get too! I haven’t even begun to dive down THAT rabbit hole. I need to make some time to add all the game I’ve played (that I can remember) and all the ones I want to play. I do like that you can add shelves so I made one for games I want to watch. I suppose I’ll have to add a “Want to Watch” shelf, too. I can’t believe that! I’ll have to check it out, and hurry up so I can try and catch you, haha. Just kidding, I’m trying to figure out if I’ll pause my play through for FFXV. I’m thinking not at first, new games usually need patches etc, so I might just wait a bit before I start it. Who am I kidding, I’ll be playing it within an hour of it’s release. They take SO long to finish. I think I’ve been playing IV for the better part of a year. I’m at the final dungeon right now and hoping I’ll get some time this week to start carving my way through it. Haha! Of course it does, murdered by the Queen, obviously. I just saw the new one wouldn’t be turn based yesterday, now I’ll probably wait a while before trying it out. I just don’t have the time or the twitch reflexes anymore to play something I can’t take my time on. Especially with the holidays coming up!